Welcome to a one-of-a-kind boutique surf shop. Swell Stuff is local, handmade and unique. 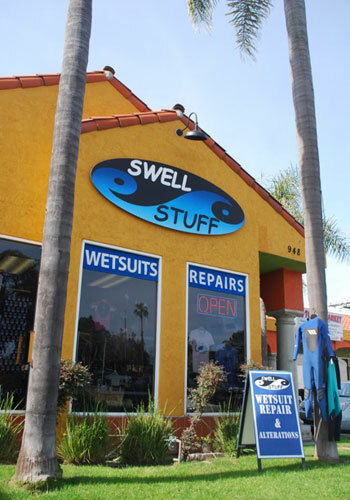 Our surf shop specializes in wetsuit repairs and alterations, ding repair and consignment sales of second hand wetsuits and boards. We also offer a selection of handmade surf products and art locally made by California surfers. We are proud many of our products are made locally and in house. Our surf accessories, swimsuits, beanies, hoodies, and more are made with the highest quality and many are one-of-a-kind durable products that withstand trends. There’s no “throw away” in our designs because we think with repurpose. Environment is top of mind and that is why we also repair, resell and recycle surf products. Don’t throw away that old wetsuit or surfboard! You can repair, recycle or sell it at Swell Stuff. We find new homes for them and keep them out of the landfill longer. That old wetsuit could become a new yoga mat!! When you visit Swell Stuff, you are supporting local artisans and the environment! Come see us soon. New designs and products move with the currents each season. Lisa Hetman is the designer and owner of Swell Stuff, a 19-year business that came by way of surfers’ needs to excel in the water. She has a BFA degree in Apparel Design from Rhode Island School of Design and got her start in the fashion industry. Lisa lived and worked in New York City and later San Francisco, before settling in Leucadia, CA. While living and surfing at Ocean Beach in San Francisco, she was renowned for making expert repairs to her friends’ wetsuits and a viable business was born. Lisa relocated to San Diego’s north county in 2000 and opened Swell Stuff in 2008. An accomplished surfer, Lisa’s quiver of short boards gets wet. Keep surfing!